Over the last few years it has become increasingly obvious what the newest trend in shower doors has become. Whether you are watching an HGTV remodeling show or touring a newly remodeled house, there is one item that stands out from all others, a Frameless Shower Door. These types of enclosures have been replacing older styled sliding doors, corner showers and other walk in designed showers. 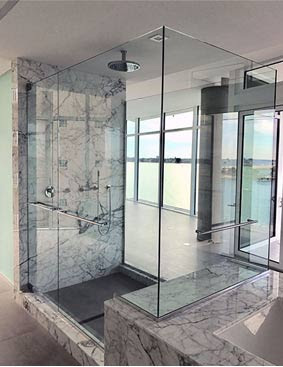 Because of their sleek, clean design and heavy, tempered glass Frameless Shower Glass doors are the primary choice when builders, architects and designers are contemplating layouts in bathrooms. Frameless shower doors offer the owner the opportunity to showcase their tile selections without the bulky aluminum channeling usually associated with older “framed” shower doors. Walk in showers now have doors that can swing both in and out of the shower making it more user friendly than their older style doors. With the addition of a product that seals the pores of the glass and repels water, frameless doors can last a lifetime while still looking like new.